I will now show you how to cook Japanese rice using a pot. In Japan, people typically cook rice using a rice cooker, but it can also be cooked in a normal pot. The pot that you use can be made from any material, such as metal, ceramic or a Teflon-coated material. Just ensure that it has a lid that fits perfectly. This is a recipe for Japanese rice. The recipe below mentions 360ml of white rice, but you can make any amount you like, so long as you adjust the volume of water to correspond with the volume of rice. The volume of water is 1.1–1.2 times the volume of rice. Pour water over the rice and briefly stir 2–3 times with your hands before immediately draining the water. Pour water over the rice again, and this time stir about 10 times before draining the water. Repeat this step 2–3 times until the water remains clear enough for the rice to be faintly visible. Lastly, tip the rice into a strainer and allow any moisture to drain away. 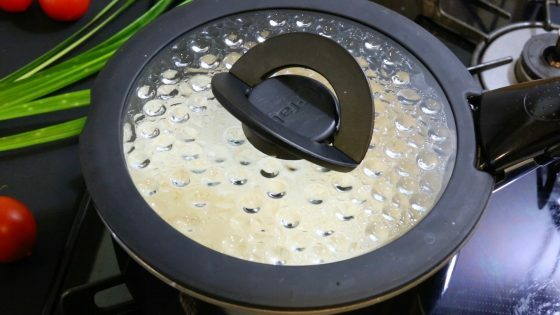 Place the rice from (2) into a pot (one with a perfectly-fitting lid), pour over the water (400ml) and leave to soak for 30 minutes to allow the rice to absorb moisture. Put the lid on the pot and place over a medium heat. When the water has come to a boil, keep the pot over a medium heat for a further minute. Once the water begins to boil over, reduce the heat to low and cook for 10 minutes. Remove from the heat and allow the rice to steam for a further 10 minutes with the lid on. Mix gently with a spatula to finish. Firstly, we will wash the rice. 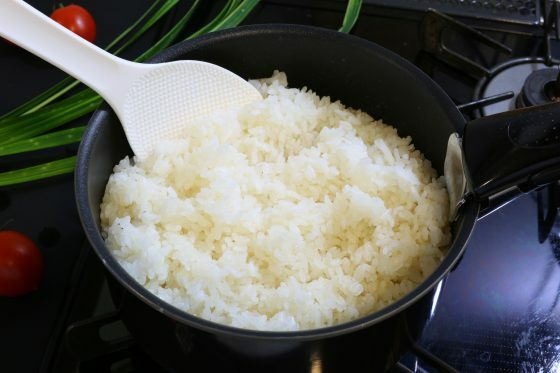 Pour plenty of water over the rice (360ml) and stir briskly 2–3 times before immediately draining the water. Next, pour plenty of water over the rice once again and this time stir about 10 times before draining the water. 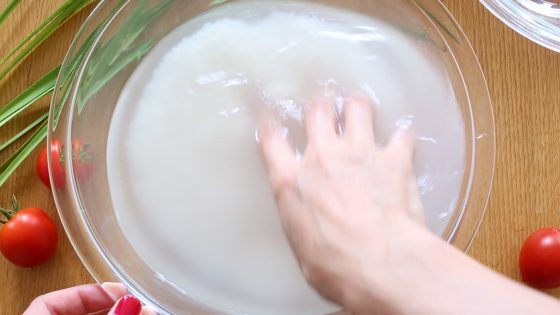 Repeat this process (pouring over water and stirring 10 times before draining the water) 2–3 times until the water becomes less cloudy and remains clear enough for the rice to be faintly visible. Lastly, tip the rice into a strainer and quickly drain away the moisture. When washing the rice, immediately discard the first batch of water after stirring briskly 2–3 times. The first wash also serves the purpose of rinsing away any rice bran on the surface of the rice. If you allow the rice to soak for too long during this process it will absorb the odor of the rice bran, diminishing its flavor. The rice washing is complete when the cloudiness of the water is reduced. Next, place the rice into a pot, add the water (400ml) and leave to soak for 30 minutes to allow the rice to absorb moisture. The rice is cooked after first leaving it to soak in water for around 30 minutes. 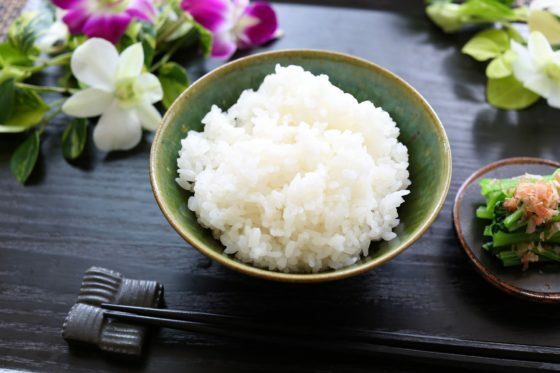 Allowing the rice to absorb plenty of water ensures that the heat can easily reach right to its center, resulting in fluffy rice. After 30 minutes have passed, place the pot on the heat. Fit the lid tightly on the pot and place over a medium heat. When the water has come to a boil, allow it to sit for a further minute. After one minute, once the water begins to boil over, reduce the heat to low and heat for a further 10 minutes. Once 10 minutes have elapsed, remove from the heat and allow the rice to steam for a further 10 minutes with the lid on. Once the rice has been removed from the heat, allow it to steam for a further 10 minutes with the lid on. Steaming the rice at the end ensures that moisture permeates evenly all the way through, resulting in fluffy, delicious rice. Mix the rice gently with a spatula to finish. This recipe makes about 660g of cooked rice. 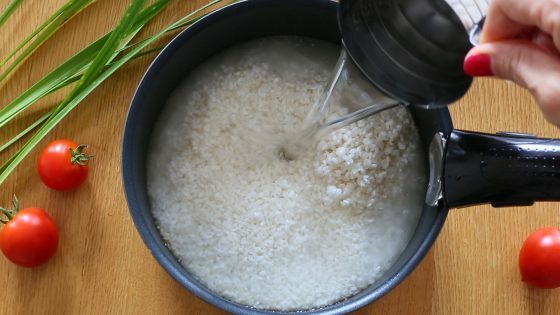 You can easily make moist, fluffy Japanese rice, even with a basic pot.